Are you currently sitting on a small fortune in aluminium cans? If so, you might be wondering about the best way to offload it. Here at Reliance Scrap Metal, we are proud members of the Aluminium Federation and are committed to offering the very best prices for all suitable scrap metal. If you’d like to discuss your needs, give us a call now on 01202 673539 or continue reading to see how we can help. As a material, aluminium features many excellent qualities that make it highly sought-after by scrap metal companies. For starters, it is incredibly durable and malleable, providing impressive strength while being flexible enough to bend and shape. It is also ductile meaning that it can be drawn out into a thin wire. In the UK, around 9 ½ billion aluminium drink cans are produced every single year resulting in a lot of potential wastage. The process of turning old cans into new cans is called loop recycling. Every single can produced using aluminium can be turned into a new can which helps to reduce the amount of waste being dumped at landfill sites. Plus, this also helps to save on energy making it a great option for protecting the environment. Featuring a third of the stiffness and density of steel, outstanding heat and electrical conduction properties and exceptional resistance to corrosion, aluminium is suitable for many different applications. At Reliance Scrap Metal, we are officially accredited by the Bureau of International Recycling to provide a complete scrap metal recycling service. 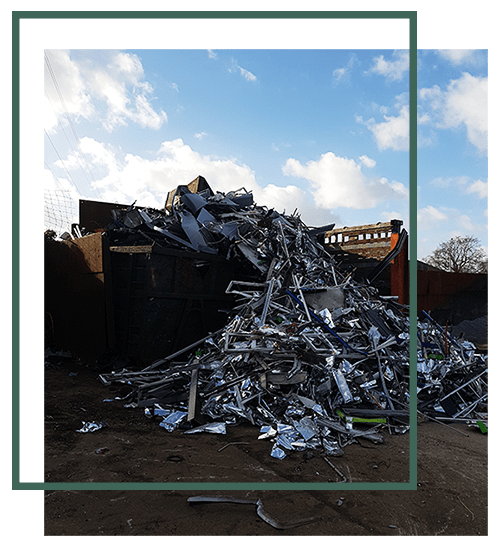 In fact, we are able to accept a wide range of scrap aluminium items such as radiators, cast scrap, rolled out sheets, castings, cables, extrusions and more. We provide a wide choice of skips as well as a broad range of services from recovery to segregation and processing. If your business requires these, we can also supply you with stillages, bins and drums for convenient storage as well as plastic boxes for safe transport. If you require aluminium can recycling, simply pick up the phone, and we’ll be happy to provide you with helpful advice and suggestions. We’ll note down your requirements and arrange a time to collect the cans from your site. Once collected, we will weigh them and provide you with a prompt and accurate valuation. Here at Reliance Scrap Metal, we have access to the most up-to-date buying prices thanks to our company computer system which actively tracks current market trends. Plus, we are currently able to offer the very best prices for your aluminium scrap metal. Furthermore, we will provide you with a friendly and efficient service for all your disposal needs.